Updated 6/30/18 8:53 a.m.: On June 28, 2018, Dan Griffin of WLWT reported that following a packed school board meeting on the same day, Hamilton district officials have decided to slow down the process of arming staff members pending further public input. According to a CNN report there have been 20 school shootings in the United States as of April 20, 2018. Over 187,000 students have experienced the repercussions of gun violence since the school shooting at Columbine high school in 1999. Writer Rita Armitage takes an in-depth look at gun violence in and outside of the schoolhouse doors in America. According to the Gun Violence Archive, 13,286 people were killed by gun violence in 2015. Americans own about 48% of the world’s citizen-owned guns, and they own more guns per capita than any other country in the world. Gun homicide rates are 25.2 times higher in the US than in any other high income country. It is an undeniable fact that gun ownership is a part of American culture, and that we have a problem with gun violence. America makes up about 4.4% of the world’s population. However, it has about 31% of the world’s mass shooters. Defining what constitutes a “mass shooting” is difficult. Organizations use the term in different ways. We have chosen to define a “mass shooting” as the purposeful use of a firearm to injure and/or kill a group of others. Mass shootings in America are deadly and numerous: The Los Angeles concert shooting — 58 killed, over 400 wounded; the Pulse Nightclub shooting — 49 killed, approximately 50 wounded; the Virginia Tech shooting — 32 killed; Sandy Hook Elementary School shooting — 27 killed; Sutherland Springs Church attack — 25 and 1 unborn child killed, 20 wounded. There have been hundreds of shootings since, including the recent tragedy of Parkland, Fla. In fact, of the five worst shootings in America’s history, three of them have happened within the last two years. Mass shootings affect all Americans; victims are of different ages, races, sexual orientations, economic classes, and religions. The shooters, however, are almost always white males. Gun violence in the form of mass shootings is a very small percentage of total gun deaths, most of which are homicides or accidents with handguns. However, they are also preventable. In the 1980s and 1990s, Europe and Australia both had mass shootings. In 1996 in Britain a man took a gun into a school, killing 16 children. After public pushback, the UK made reforms, and there hasn’t been a school shooting in the UK since. However, the issue of gun control legislation is politically polarizing in America. Some of the most famous shootings have been attacks on schools, such as Sandy Hook — whose victims mostly consisted of 5 and 6 year olds, Columbine, Virginia Tech, Texas Tower, and now Marjory Stoneman Douglas in Parkland, Fla.
On Valentine’s Day of this year, 19-year-old Nikolas Cruz used an AR-15 to kill 17 and injure 15 people in Marjory Stoneman Douglas High School and the nation’s eyes have been focused on school safety ever since. The survivors of Parkland have been taking action — organizing marches and walkouts, as well as pressuring government officials for stricter gun laws. They have been calling for more extensive background checks with a longer waiting period. Activists have also requested raising the age of how old you have to be to buy a gun, and they have called for the banning of automatic weapons as well as bump stocks, which allow rapid-succession firing. They’ve also advocated for making it so that a person with mental health issues cannot buy a gun. In addition, they’ve lobbied against the National Rifle Association and for common-sense measures such as banning people on the terrorist no-fly list from buying guns. Some argue that we need to take other measures and that gun control is not the issue. Perhaps the most polarizing school safety suggestion has been the idea of arming teachers and other staff members with guns — an idea that is supported by Butler County Sheriff Richard K. Jones. On Feb. 18, 2018 Jones took to Twitter to offer free conceal and carry classes to teachers in the surrounding area. There have been very few examples of how arming teachers could impact a potential school shooting situation. Some worry that arming teachers with guns, even if the educators are given extensive firearm and safety training, could make schools less safe. Another major argument is that we need resource officers or police officers stationed in schools. Parkland and Columbine both had a school officer present who was not able to stop the massacres. President Trump has been indecisive on this issue. He went on national television after the shooting in Parkland and promised to raise the age limit on purchasing rifles and he also called for near-universal background checks. However, under criticism from the NRA and other republicans, he backed down and issued a press release stating the administration was “still studying the issue.” He has expressed interest in the prospect of arming teachers. Other responses to school safety concerns include the use of metal detectors and airport-like security. Some school districts are even putting in systems that will distract and confuse a shooter, such as one that will fill the hallways with smoke. Although systems like the one above have proven to be effective in trials, they haven’t been proven in real-life situations, and they are extremely expensive. More security may keep targeted groups of people safer, but many students express uneasiness at the idea of having to through such time-consuming and intense procedures. Many schools are taking less-severe measures though, such as designing schools with bulletproof glass and increasing the number of security cameras on campus. Both advocates for and against stricter gun legislation have supported strengthening mental health programming in schools. Their reasoning: if you could talk to a potential future school shooter, and get the person the help they need, then the shooting might never take place. Counselors are the foundation for most mental health plans in schools and are relied upon for broad mental health services. The American School Counseling Association recommends the ratio of students-to-counselors be 250-1, however, the average student to counselor ratio in the US is currently 482-1 for K-12 schools. Emma Gonzalez, Cameron Kaskey, David Hoggs, and the rest of the Parkland students have sparked a growing movement in gun control activism. In the days following the Parkland shooting, students started planning a National Walkout on March 14 to commemorate the victims and call for gun control. However, some students in Florida couldn’t wait, and participated in less orchestrated walk outs to support their fellow Floridian students. Some in Tallahassee marched to the capital, some marched to city hall — one school district walked over 10 miles to the site of the shooting. The National walkout happened on March 14, with thousands of students walking out all across America, some facing disciplinary actions from principals and superintendents. Madison High School student Cooper Caffrey and 42 of his classmates were given detentions for participating in the walkout. Caffrey was a victim of a 2016 shooting at the Butler County, Ohio school. In a few schools, only one or two kids walked out. In others, all the classrooms were empty. There were massive walkouts from schools who have had shootings, such as Columbine and Sandy Hook. Participation wasn’t just limited to high schools. There were middle school walkouts and even a few elementary school walkouts. The students stayed outside for 17 minutes in remembrance of the 17 victims of Parkland. On March 14, 2018, over 250 students at Talawanda High School walked out of their fourth-period classes to show their support for the victims and survivors of the school shooting in Parkland, Fla. 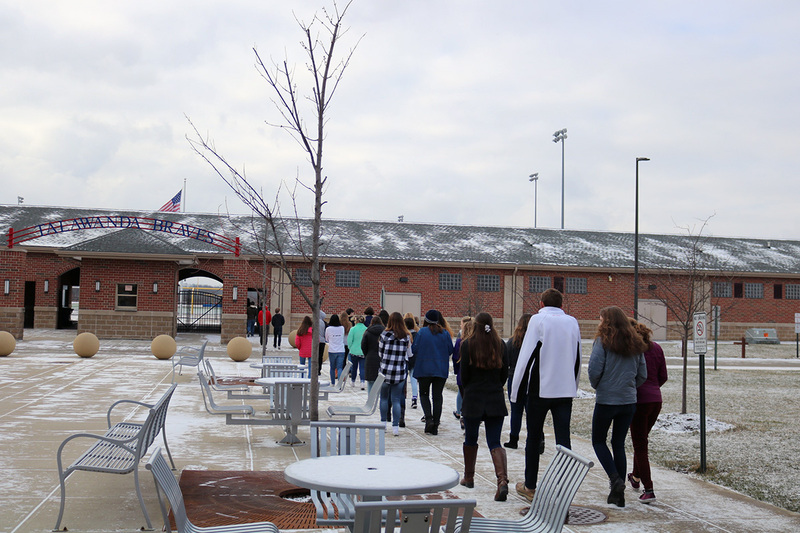 Organized and managed by Talawanda students, the walk-out lasted 17 minutes, in honor of each of the victims in Parkland. 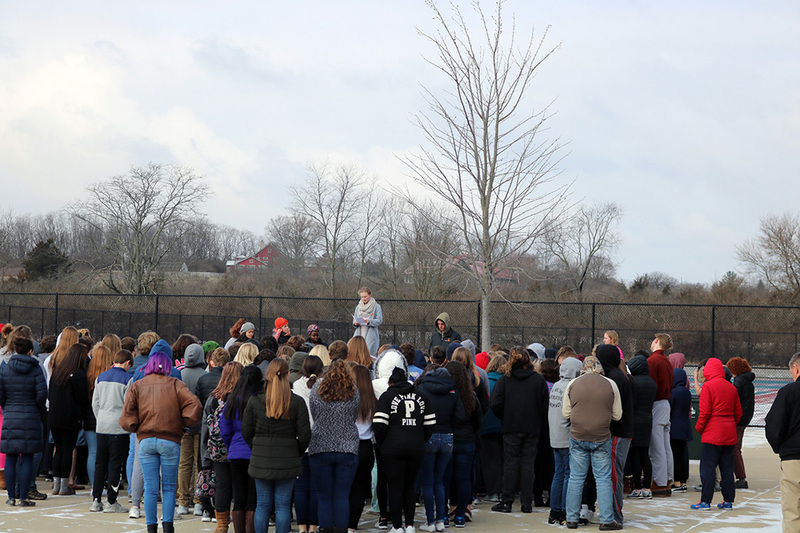 Students stood in the cold and spoke about the matters of gun violence, school safety, solidarity, and they remembered the victims of the shooting. Speeches were given by organizers sophomore Ella Cope, senior Maddy Abowitz, senior Mazvita Ngorosha, and senior Amily Zhou-Wang. Cope spearheaded the event. Over 187,000 students have experienced the repercussions of gun violence since the school shooting at Columbine high school in 1999. Around the country, it’s clear that students are determined to decrease that statistic. Like all schools and universities around the country, Talawanda has also prepared for events of violence. Teachers go through training and active shooter drills and all administrators go through National Incident Management Training. Some teachers go through ALICE training, which stands for Alert, Lockdown, Inform, Counter, Evacuate. ALICE started after the Sandy Hook shooting in 2012. Some faculty, such as guidance counselor Scott Davie, have gone through special training in case of such an emergency. This training includes watching videos of other shootings, talking about steps to take during a school shooting event and practicing ALICE. It also includes the “Run, Hide, Fight” options outlined by The Department of Homeland Security’s Active Shooter Preparedness program. Davie said, “People don’t realize the swiftness of how it all takes place.” He notes that there are so many concerns to try to prepare for, such as if a shooting has ended, how and where do we regroup students? If some have ran and some are still in the building, how do we contact parents? Davie also emphasized the fact that the entire community would be engaged in responding to an event such as this. Not only the police — including the Butler County Sheriff’s Office as well as the Oxford Police Department– but firefighters, local hospitals, local government, and emergency medical services would all be involved in responding. There is a hierarchy setup where the highest ranking person with the most training would be in charge until police or first responders show up. There would be people who are not only stopping an incident, but there would also be those helping Talawanda with regrouping and with crisis management, such as re-unification or outreach, after it was over. We, as a nation, society and community have a problem. We also have many ideas on ways to solve it — but as we debate and quarrel, our children are dying in places they are supposed to feel safe. Backpacks aren’t bulletproof.